I can’t tell if the parrot on the ball is dancing or in love. But Google thinks that Rick’s George’s legal technology blog is about parrots and tennis balls. We’ll come back to this later…. LexBlog’s product – stand-alone blogs – runs counter to widely accepted SEO theory, to such a strong extent that if you believe the search is powerful in generating clients for law firms, you’d never remotely consider a stand-alone blog. Top 10 Signs your SEO company is a quack. 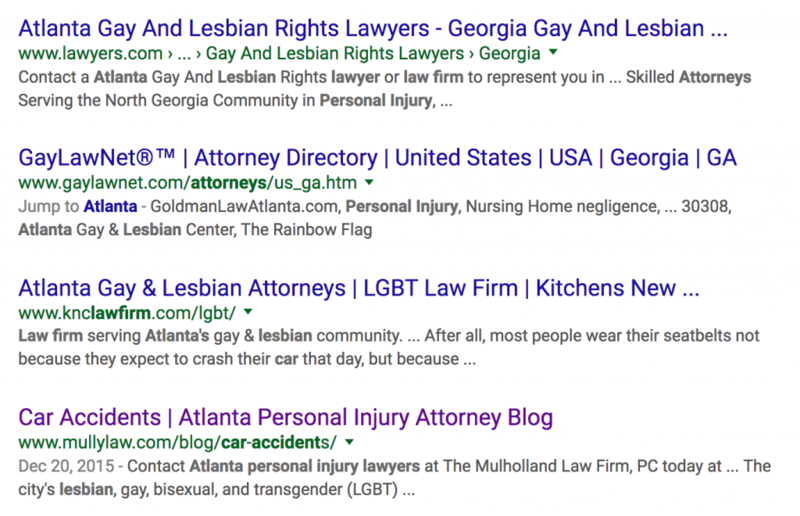 Do Law firms Needlessly Worry About SEO? Is your Law firm SEO company doing more harm on Google than good? Blogging for SEO or meaning? Law blogs are solely for SEO and law firm rankings? Right before Christmas, I unintentionally ended up in a snarky exchange with Kevin in the comments on yet another anti-SEO post called: You Don’t Need to Game Google. The genesis of the interaction, was my pointing out that the results he was claiming (top google rankings without worrying about SEO) just didn’t pan out in the actual search results. Kevin cited a post from aforementioned attorney Rick Georges who claimed that he ranks at the top of Google for the term “legal technology” without requiring SEO to do so. A tempting thought – especially if you are a law firm dropping 4, 5 or 6 figures on search agencies like mine. However, a little digging showed Kevin’s example to be 100% inaccurate. 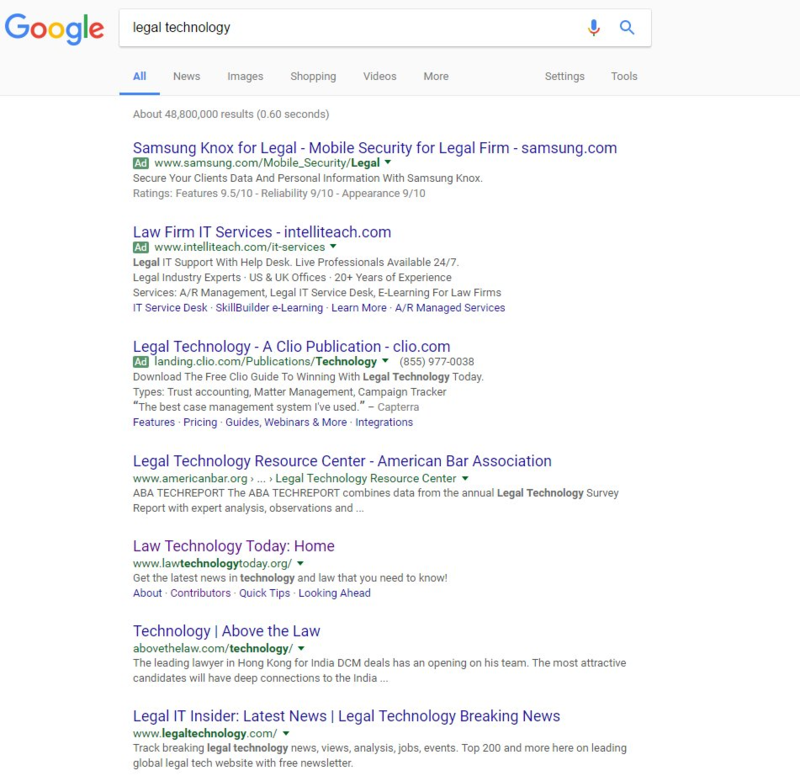 You’ll note below a quick review of the SERP results for “legal technology” are entirely devoid of Rick’s presence – I scrolled through 8 pages and never encountered his blog. Try it out for yourself and see. So much for ignoring SEO right? And this isn’t the first time Kevin has made unsubstantiated claims about SEO success without the need for engaging in SEO fundamentals. The blogging lawyers I mentioned above do not spend one cent on SEO. Yet they rank above most all of the lawyers who do. This refrain – “ignore SEO and you’ll outrank those who pay for it” – is a dangerously expensive misrepresentation to broadcast to the legal industry. What follows is the explanation of my opinion of why Kevin tenaciously sticks to his anti-SEO message. The assessment is very simple: SEO is a threat to stand-alone blogs and remember, LexBlog sells blogs as a standalone product. When you are a hammer everything is the world is a nail. Make up your own mind, but if you are considering a standalone blog – critically consider these four talking points from the Lexblog sales pitch before overlooking the importance of SEO. It’s common sense that a blog is an independent publication. In my opinion, LexBlog continues to badmouth SEO simply because their primary product – standalone blogs – runs afoul of foundational SEO theory. The widely accepted theory, that in almost every case, you should consolidate authority (links) to create a single, strong powerful domain. Mathematically (and grossly oversimplified) – 20 links to one domain are more than twice as effective than 10 links to two. And that domain should be the law firm’s website that is listed in directories and cited by local media sources; not a social media driven blog. Put differently, marketing two websites is more than twice as expensive as marketing one. Blogs by their nature are link magnets. And links from relevant blogs/websites are the holy grail of SEO. In hypercompetitive markets like legal, links are the differentiator in both organic and local search. Linkbuilding is the tough, expensive, uncertain practice that, as Kevin notes, drives SEO success. And SEO success leads to traffic and in turn, more business. Due to their more causal and timely nature, blogs can be extremely effective in generating links. Segmenting blog content onto a stand-alone domain guts a site’s linkbuilding potential. We saw one beautiful example of this: after watching traffic dry up to their stand-alone niche blog, one client landed a $1.5 million check simply by migrating their good content from their impotent blog, onto the firm’s primary domain. The traffic returned, as did the phone calls, and then the client. More: How Our ex-Client Made $1,500,000 by Firing Us. The goal is not to draw traffic and attention. There’s a full LexBlog post on this: “Traffic is not the measure of a law blog’s influence” and I couldn’t disagree with this statement any more. SEO generates traffic and website traffic – especially traffic from within your geographic market – generates inbound inquiries at a rate of about 3.3 calls per 100 sessions (4.5 for PI lawyers). So if the goal for your firm is new business, a reasonable objective of your website is traffic. It’s a very direct and indisputable correlation. Saying traffic doesn’t matter is like having your retirement planner telling you the size of your 401(k) is immaterial. I don’t know about Rick, but there is a world of lawyers who get their work by word of mouth and relationships, with the Internet just enhancing and accelerating this. Its nice to build relationships – we all like to do so. But, building relationships with new prospects requires attracting new prospects with which to build relationships. There’s simply no easier, more scaleable way for the Internet to enhance and accelerate your relationship building than SEO initiating new relationships with prospects who are searching for what you offer, but don’t know who you are. And those SEO sparked relationships frequently turn into clients. Kevin is right that content is king. Mockingbird has taken the anti-content perspective so far as to deliberately prune content from (many of our clients’ sites – and we’ve seen an increase in traffic and business for our clients. (See – there’s that pesky correlation between website traffic and new business again). Here’s the analysis I posted to Search Engine Land: More Content, Less Traffic Part I. More content alone isn’t going to build your business; this is simply an inconvenient truth that most legal marketers would have you believe because it conveniently absolves them of accountability. Back to the parrot and the tennis ball….A quick review of Rick’s site showed a litany of technical SEO failures – no H1s, thousands of erroneous indexed pages (including our friend the parrot) etc. so I wasn’t surprised in my findings. Further, Ricks’ perceived success was most likely due to personalized results – he saw his own Google Plus page… on the third page of results. A classic false positive. 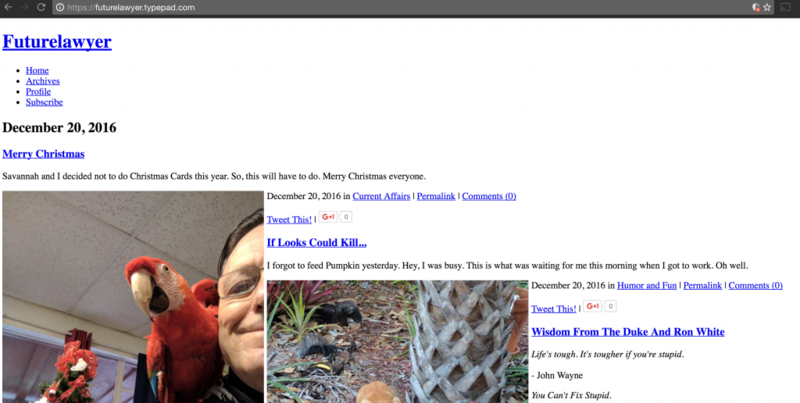 In the parrot example – Rick’s dated blog has an entire page with nothing on it but the amorous parrot – and a stupid computer has no way of knowing that this parrot page is more or less important and relevant than the legal technology pages on the site. Rick could build so many more relationships with prospective clients if the Google thought his Legal Technology Blog was about legal technology or could differentiate the content in the pages on his blog by their distinct headings or if his blog’s technology wasn’t broken. These are basic, SEO 101 errors. It makes me sad to see attorneys working so hard on the wrong things, convinced otherwise by erroneous ranking reports. The SEO reality is, a well done blog will generate just as much, if not more business for the entire firm when housed on the firm’s primary domain. For whatever reason Conrad you don’t get what others value. No one is saying SEO doesn’t matter. SEO just matters more to some lawyers than others and that’s great. If some lawyers want tp pay thousands of dollars of month in SEO that’s okay too. I am sure most get a return doing so. But belittling lawyers you don’t know because you feel insecure isn’t becoming of someone serving our legal profession. Rick Georges told the world what’s worked for him, I site his example and you decide to set up strawman arguments to attack us. That’s BS, but if that’s what you need to do to drum up business, have it. As I explained in the exchange on my blog, I am delivering a different product. A vehicle in which to build a name for yourself vesrsus advertsing on Google – understand it’s organic. My customers measure success by the name they build, their relationships and busines So the decisions we make and the advice we give are based on how to achieve this, not by search performance. Arguing that what LexBlog says doesn’t measure up to how Conrad Saam believes everyone should measure success is just silly. I wish you continued success but this attacking people needlessly is not a world I am going to play in, Have fun. Ouch, Kevin. I think your response undercuts your credibility here. I’m not sure where you’re going with the idea that “SEO matters more to some lawyers than others.” You promote the idea of using a blog to build a reputation and set of connections. Great. I do too. So does Conrad. You say it’s better that it’s organic, as if SEO was “not organic” or unfairly gaming the system. Maybe in the blackhat days of the early 2000s you’d have a point. It’s unfair when you buy a zillion links from spammers to increase your site’s rank. I guess. But what Conrad is talking about the value in understanding how to structure your website so that it serves your client’s needs. Things like H1 tags, being mobile friendly, understanding how your site appears on different browsers. All good stuff in and of itself that also happens to positively affect rankings. That stuff should matter to any lawyer that wants to (1) get a message out online and (2) persuade people. You seem to argue that “organically building your reputation,” which is what Lexblog does, is somehow exempt from SEO rules. I don’t think so. We’re living in Google’s world (and more and more FB’s world). So design matters. SEO is part of design. People like Seth Godin can get away without doing SEO and using a Typepad site. The fact that Seth Godin exists doesn’t mean that small town lawyer starting a website in 2017 should copy what worked in 2005. As an attorney who’s coded my own website since 2006, I can tell you the online market has changed dramatically in the last few years. Not only have there been dramatic changes in how sites are coded, but there’s been an explosion of money and resources dedicated by national players intending to dominate the online legal market. It’s naive to think that an attorney can do nothing more than blog and be noticed by prospective clients (unless the attorney is in a highly-specialized niche market or very small market). First off, if the attorney isn’t using proper technique for separation of document content from document presentation (HTML, CSS, H-tags, images with alt-tags, Schema, etc), Google won’t even know that blog exists (or care). Furthermore, if that site is not promoted somehow (via citations, backlinks, or PPC ads), it will likely never be able to compete with the massive volume of material being put out by national players (e.g. Avvo, Nolo, FindLaw, Martindale, etc). Attorneys need substantive content, dialed-in with best-practices SEO. This is because sites must be readable by Google, and Google doesn’t yet read like a human being. Sites must also be readable and usable by human beings– not only because click-through-rates and bounce rates affect which sites are shown to human readers– but because prospective clients need to like what they read and be motivated to contact the firm. No matter how good some content is, some of it will need to be promoted because of the sheer volume of similar content out there. Substantive content is still key, and the substantive content on a site can be a blog or static website, but being “anti-SEO” is like being “anti-typography” in publishing or “anti-color” in graphic design. If your site isn’t readable by Google or usable by humans, that site will simply not be seen. I’m a bit late to this, but agree that SEO matters. We run a site (https://www.litimetrics.com) that tries its best to make SEO matter less for litigation attorneys, by providing information about experience and performance based on data from court records. The irony is that for these pages to show up anywhere decent on Google, they need to rank well, which means SEO. Can’t escape the SEO beast!